Offers balanced compression that'll keep the low-and high-end of the bass well sorted. Bass guitar is one instrument that definitely benefits from compression to keep its signal consistent and punchy, but with its wide range of frequencies, getting just the right compression for a bass guitar can be tricky; lots of compressionto keep the bass end in check could be detrimental to the treble sound and vice versa. 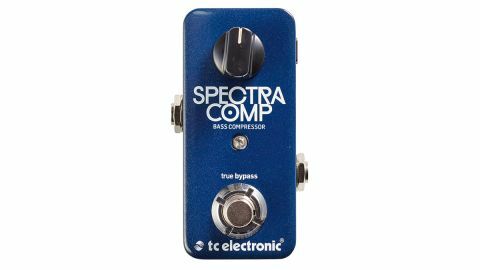 The way to go is to use multiband compression - a method that applies different amounts of compression for high, mid and low frequencies to keep the overall sound balanced, which is exactly what the SpectraComp has been designed to do. While the processing might sound complicated, the pedal couldn't be easier to use. There's a single knob to dial in more compression and that's it - although if you want to tweak things, the free TonePrint software editor lets you dig deep or load complete tones from TC's library. We found that it kept the signal smooth and present with an even mix of weight and snap.